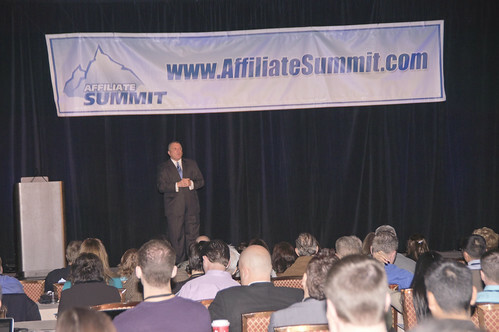 There was a keynote presentation by Daniel “Rudy” Ruettiger, who the movie “Rudy” was based on, at Affiliate Summit West 2013, which took place January 13-15, 2013 at Caesars Palace Las Vegas. Daniel “Rudy” Ruettiger carved his name into history books at the University of Notre Dame in just twenty seven seconds. The son of an oil refinery worker and third of 14 children, Rudy rose from valleys of discouragement and despair to the pinnacles of success. It took years of fierce determination to overcome obstacles and criticisms, yet Rudy achieved his first dream – to attend Notre Dame and play football for the Fighting Irish. As fans cheered RU-DY, RU-DY, he sacked the quarterback in the last 27 seconds of the only play in the only game of his college football career. In 1993, Tristar Productions immortalized his life story with the blockbuster film, Rudy. The critically acclaimed film received “Two Thumbs Up” from Siskel and Ebert and continues to inspire millions worldwide. Rudy has co-authored several books, including Rudy’s Insights for Winning in Life, Rudy’s Lessons for Young Champions, and Rudy: My Story, which was published in September 2012. He has also established the Rudy Foundation, whose mission is to help children of all ages around the world reach their full potential. The Rudy Foundation develops and supports programs that positively impact the lives of children cognitively, emotionally, physically and spiritually. The post Video of Rudy Keynote at Affiliate Summit West 2013 appeared first on Affiliate Summit.